Blackboard Eggs ~ Write messages on eggshells with this great idea from Oleander and Palm: Coat eggs with a layer of chalkboard paint and let your chalk do the talking. If you fall out of love with a pattern or picture, wash the surface and draw again. 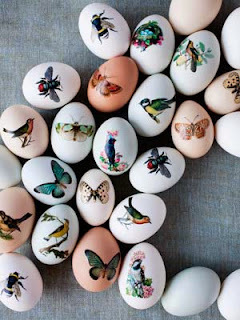 Decal Eggs ~ If you apply these nature-themed decals to hollow eggs, you can display them year after year. You will need Ink-jet printer, Clear decal paper, Craft scissors, Spray varnish and Decal eggs clip art. Step 1: Print clip art onto decal paper. Step 2: Spray the paper with two coats of varnish; let dry after each coat. Step 3: Cut out individual decals, staying as close to the designs as possible. Soak them in a bowl of water for about a minute. Step 4: Remove a decal from the water and slowly separate it from its backing, sliding it onto the egg as you go. Smooth with your fingertips. Gently press a paper towel against the decal to absorb excess water. Step 5: Let dry a few minutes; repeat with additional decals. 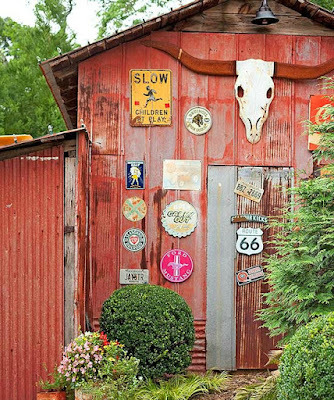 Try multiples of the same design, or a collage of different images. Step 6: Let dry overnight, then spray with a coat of varnish. 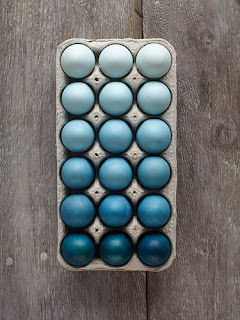 Ombré Easter Eggs ~ You can create this dramatic display with just two 0.25-ounce vials of blue dye you may already have in the kitchen. Set out six 12-ounce glasses, labeled A through F. Add one cup of boiling water and two teaspoons of white vinegar to each and stir, using a separate spoon for each glass. Then, mix in the color as follows: A, two drops; B, six drops; C, 10 drops; D, 20 drops; E, 45 drops; F, 60 drops. Submerge a hard-boiled egg in each glass. Steep for five minutes, or until you're happy with the hue, then remove and place in an empty egg carton to dry. Repeat with additional eggs (up to three dozen). Thread-Wrapped Easter Eggs ~ Give Easter eggs a crafty, homespun look with a bold stripe of neon thread. 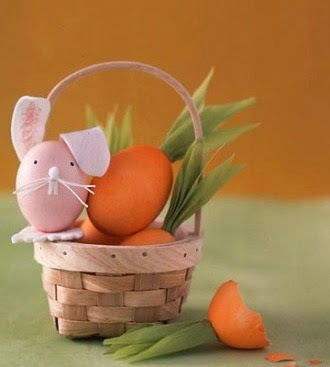 To make Easter eggs truly enticing, stripe them with a few loops of thread. 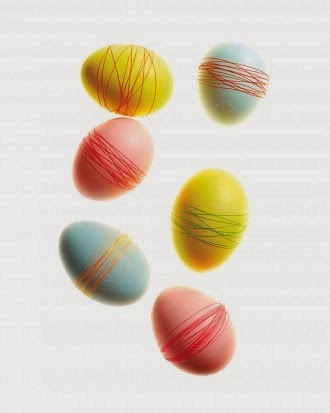 One simple way to give Easter eggs a crafty, homespun look: Add a bold stripe to dyed eggs with neon thread. Hold the loose end of a spool of thread against the egg with your finger, and wrap the spool around the egg, securing the loose end with the loops as you work; tack periodically with Mod Podge. Once you've achieved the desired coverage, snip the thread from the spool; tuck the end under, and glue in place. Silk-Dyed Eggs ~ Who knew that silk fabric transfers onto eggshells as easily as the dye in a decorating kit? Regular old vinegar plus hot water does the trick. 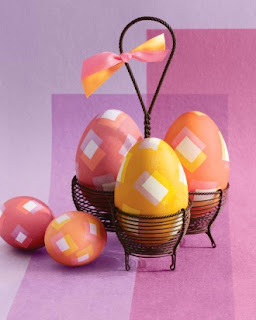 Step 1: For each egg, cut out a 5-inch square of patterned 100 percent silk. (We limited ourselves to black-and-white prints to achieve the effect above; colored patterns yield more vibrant results.) Lightly dampen the fabric, then lay it flat, right side up, and place your egg in the center. Gather the fabric tightly around the egg, like a beggar's purse, and secure with a rubber band. Repeat this step for the same egg, using a same-size square of plain white cotton and a second rubber band. Note: Use blown eggs if you'd like to keep your handiwork longer. Step 2: Place eggs in a single layer in a nonreactive pot and add enough water to cover them by 2 inches. Add 4 tablespoons of white vinegar. Bring the water to a boil, then reduce heat and simmer for 40 minutes. Step 3: Remove eggs with tongs and cool about 20 minutes. Then unwrap the fabrics to reveal the exquisite designs. 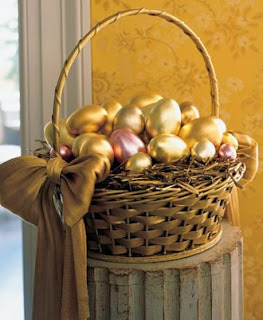 Metallic Eggs ~ Eggs covered in gold leaf add a striking touch to any Easter display. You will need Varying shades of gold leaf (Tip: Imitation gold leaf is less expensive. You may want to consider using the imitation leaf while learning the technique. ), Small paint brushes, Gilding size adhesive and Gilder's paintbrush. Step 1: At a crafts store, buy gold leaf in various shades (you'll need three or four gold sheets per egg). Blow out eggs. 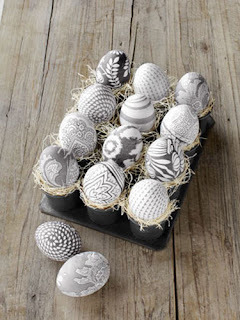 Working in a draft-free room and using a small brush, paint blown-out eggs with size, an adhesive material, and let dry on drying rack according to manufacturer's instructions. Step 2: Wearing cotton gloves, rub a thin gilder's tip brush on your hair to create static, and lift one gold sheet from the packet. Drape it over egg coated with size, and smooth with your fingers. Repeat until egg is covered. 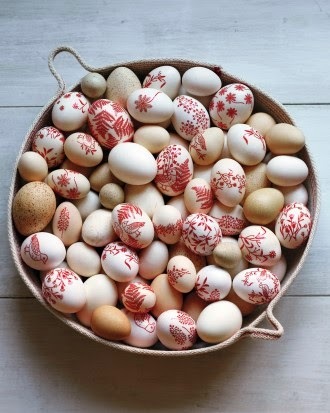 Go over egg with a soft, clean natural paintbrush to even out the texture and brush off any extra flakes. 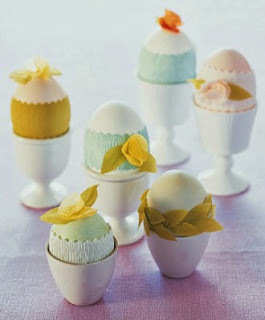 Elegant Eggs ~ Make these pastel beauties last for years by first blowing out the egg's whites and yolks. Step 1: Insert a long needle into the bottom of each egg; make a small hole, then make a slightly larger one in the top. Step 2: Move the needle around inside the shell to break the yolk. Step 3: Blow over the smaller hole — feel free to use a straw if you don't want to touch the egg directly — until the liquid drips out of the larger hole. Step 4: Run the egg under water. Blow the water out, and let the shell dry overnight. Step 5: After coloring the egg, attach fabric scrapbooking flowers ($7/150; memoryvilla.com) with tiny dots of glue. Lightly press each flower with your finger, then release. Exquisite Eggs ~ The secret behind these botanical beauties? CL contributing editor Jodi Kahn used temporary tattoo paper ($19.95 for five 8 1/2"W x 11"L sheets; decalpaper.com). Step 1: Begin by downloading free images from graphicsfairy.blogspot.com and thevintagemoth.blogspot.com Step 2: Arrange them in a Microsoft Word document, resizing each to fit on an egg. Step 3: Print the images on tattoo paper, cut them out, and adhere to blown-out eggs, following package instructions. The best source for colorful, pre-blown eggs: Brackenridgeranch.com (from 85 cents). 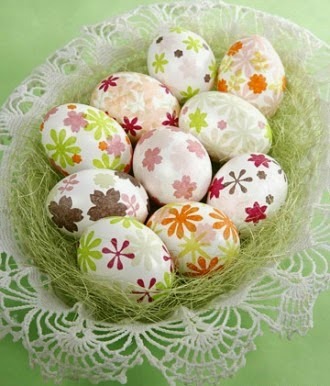 Tissue Paper Eggs ~ Use this simple technique to create beautifully decorated Easter eggs. 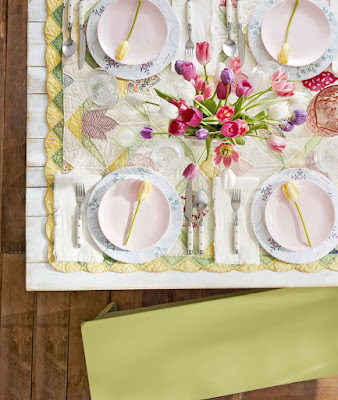 You will need Paintbrush, Tissue paper, Crafter's punch, Crafts decoupage, and a Drying rack. Step 1: Fold tissue paper four times. Step 2: Punch tissue paper with crafter's punch. Step 3: Paint a thin layer of decoupage glue onto egg. Step 4: Pick up punched-out shape with paintbrush. Starting from the middle of the punch-out and working outward, gloss over punch-out using paintbrush with thin layer of decoupage glue. Step 5: Place egg on drying rack. Big-Eared Bunny ~ Why is this bunny so chubby? From munching crepe paper-topped carrots! 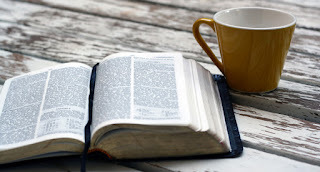 You will need Utility knife, Paper clip, Ear syringe, Dyeing mixture (1 teaspoon vinegar, 20 drops food coloring, and 1 cup warm water), Homemade drying rack of pins and foam board, White glue, Tempera paint or marker and feature templates. Step 1: Emptying eggs lets you save your creations. An adult should pierce egg at both ends with a utility knife, widening one hole a bit. Poke a straightened paper clip through wide hole; stir yolk. Place ear syringe in smaller hole; squeeze. Contents will pour out. Step 2: It's easy to make dye: Cover the work area with paper towels. In a jar, mix 1 teaspoon vinegar, 20 drops food coloring, and 1 cup warm water. Submerge the egg (keep it down with a paper cup containing water). Soak 5 minutes for light colors and 10 minutes for darker shades. Remove the egg with tongs. A homemade rack of pins and foam board makes for even drying and quick cleanup. Step 3: Dye or paint should be fully dry before beginning. Affix features with white glue (on crepe paper, use tiny dots of glue); let dry at least 20 minutes. Add small details like eyes with tempera paint or a marker. 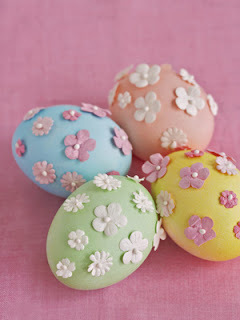 Washi Tape Eggs ~ Put metallic, patterned and pastel Washi tape to good use with this cute no-dye egg-decorating option. 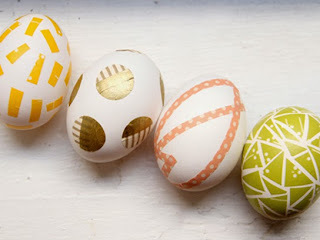 Cut tape into various shapes and stick to egg surfaces. Tied Flowers ~ For less of a mess, nix the dye. 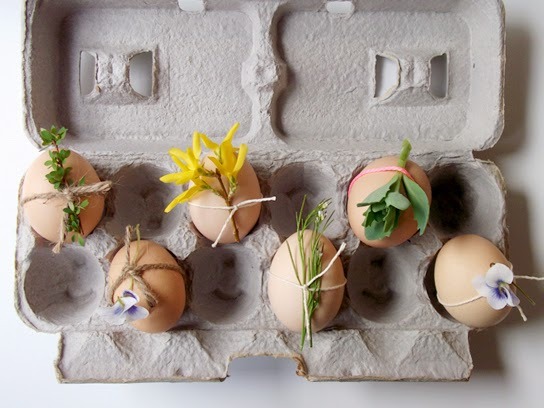 Instead, use string or baker’s twine to secure flowers and herbs to eggs. Opt for forsythia and violet buds, or try rosemary or thyme for a hint of fragrance. 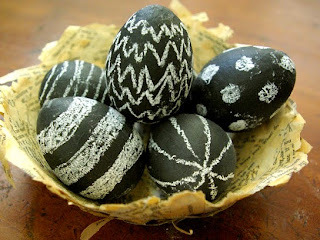 Striped Crepe Paper Eggs ~ Combine various techniques -- bands, leaf garlands, and flowers -- to dress up plain and dyed eggs with crepe paper. 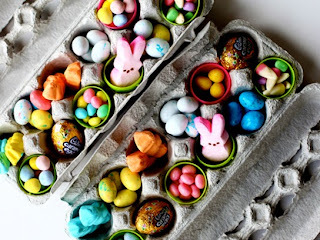 You will need Bunny ears template, Crepe paper, Craft Glue, Blown-out Easter eggs, Paint pen, Pom-poms, and Mini muffin-cup liners. Step 1: Using our template as a guide, cut 2 ears (in direction of grain) from a folded sheet of crepe paper. Fold back base of each ear, apply glue to underside, and adhere to egg. Draw eyes with a paint pen. To make a nose: Glue a pom-pom over one of the holes used to blow out the egg. To make a tail: Glue a larger pom-pom over the other hole. Step 2: To make a nose: Glue a pom-pom over one of the holes used to blow out the egg. To make a tail: Glue a larger pom-pom over the other hole. Step 3: Arrange a fringed strip of crepe paper "grass" in a mini muffin-cup liner; place bunny in liner. Square-Patterned Eggs ~ Bright colors and geometric designs make modern-looking eggs, like these square-patterned ones. 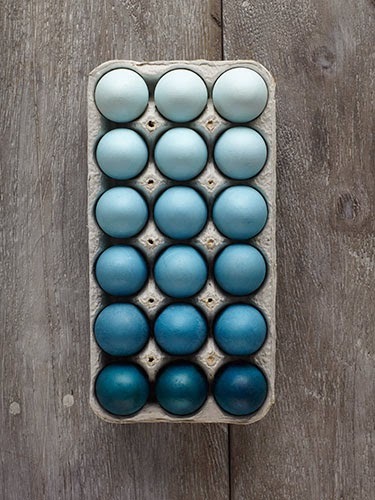 Bright colors and geometric designs make modern-looking eggs. Here, we've displayed a trio of square-patterned eggs in a graceful vintage wirework holder. To create the pattern, pieces of electrical tape are shifted slightly between two dips in dye. For chicken eggs, we used 1/2-inch squares; for goose eggs, slightly larger squares as well as rectangles. When layering hues, start with the paler one and move on to the darker one. Wax-Resist Patterns ~ For thousands of years, Ukrainians have created elaborately patterned eggs called pysanky using a wax-resist process. Wax is applied to an egg, which is then dipped in colored dyes. When completed, the wax is melted off, revealing all the colors beneath. You will need Food coloring, Beeswax, Bowls and spoons (for dyes), Cookie sheet, and Wax paper. Step 1: To make a striped egg, dye a raw or hard-boiled egg pale yellow (for richer colors, increase the proportion of coloring to water). Remove and let dry. Step 2: Melt beeswax in a pot. Dip both ends of the egg in wax; this will prevent that area from absorbing the next color. Step 3: Place the egg in the green dye for about one minute, then remove and let dry. Dip both ends of the egg deeper in the wax than before, leaving a narrow unwaxed band around the middle of the egg. Step 4: Place the egg in dark blue dye to color the middle stripe. When finished, place the egg in a 250-degree oven on a cookie sheet lined with waxed paper for about 5 minutes. Take the egg out and wipe off melted wax with a paper towel. If you used a raw egg, let egg cool and carefully blow out contents. 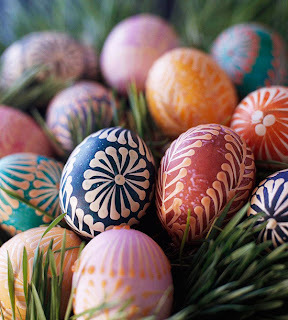 To make a half-colored egg, hold an egg partially submerged in a strong dye for about a minute. 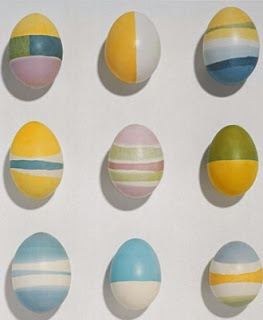 To create eggs with bands of white, dip-dye both ends, then dip each end in the wax to cover the dyed area plus a stripe of white beyond them, then proceed as above.